It didn’t take long….. but it happened! Israel has sent crowd dispersal weapons to Egypt. If the Egyptian Army won’t attack the people, it looks like Israel might have to do it for them…. The International Network for Rights and Development has claimed that Israeli logistical support has been sent to Egypt’s President Hosni Mubarak to help his regime confront demonstrations demanding that he steps down as head of state. According to reports by the non-governmental organisation, three Israeli planes landed at Cairo’s Mina International Airport on Saturday carrying hazardous equipment for use in dispersing and suppressing large crowds. In the statement circulated by the International Network, it was disclosed that Egyptian security forces received the complete cargoes on three Israeli planes which were, it is claimed, carrying an abundant supply of internationally proscribed gas to disperse unwanted crowds. If the reports are accurate, this suggests that the Egyptian regime is preparing for the worse in defence of its position, despite the country sinking into chaos. And, of course America’s hands are far from clean in all of this…..
People in the street confronting police and army soldiers with revolutionary aspirations. Some youth throw stones in symbolic acts of resistance as the elders try to calm down their rage and focus on chants of unity. Armed forces reply with tear gas and rubber-coated steel bullets. This is a regular occurrence in the West Bank in villages like Nabi Saleh, Ni’ilin and Beit Umar. 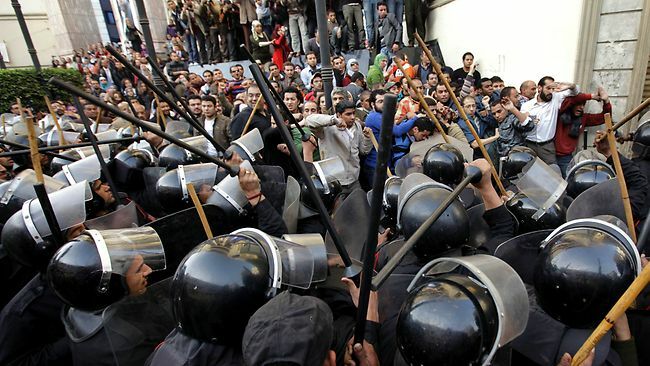 Over the past week, it has been unfolding on the streets of Cairo, Suez and Alexandria as well. From Ni’ilin to Cairo, the tear gas that is being employed against demonstrations is made in the United States. The story of American made tear gas in Egypt has recently entered the chaotic international news cycle to the dismay of the American government. But journalists have been focusing only on the fact that the tear gas is supplied by the United States.Tweets and media reports from Egypt are full of photos of and references to tear gas canisters “Made in the USA” and produced by Combined Systems Inc. in Jamestown, Pennsylvania. The Israeli army regularly uses high velocity tear gas canisters against unarmed demonstrations in the West Bank. The Egyptians armed forces and police have so far refused to employ high velocity canisters based on the fact there have been no reports from the ground of their existence in the demonstrations. In Israel, high velocity canisters have resulted in the death of Bassem Abu Rahmah in 2009 and the critical wounding of American Citizen, Tristan Anderson. Recently, the canisters have been used in the village of Nabi Saleh, with grave results. Standard aluminum tear canisters, which are being used in Egypt, have injured thousands in the West Bank over the past eight years of demonstrations against the Separation Barrier. Soldiers regularly break army regulations and fire canisters directly at protesters– turning the canister into a large bullet– and almost never face punishment. Three weeks ago, a soldier fired a tear gas canister directly at me from a distance of 15 meters in Beit Ummar. Luckily I was able to get out of the way. Last summer, an American Jew was not as lucky as me and lost her eye in a demonstration when a tear gas canister was fired directly at her head. The soldier who fired the canister was cleared of any wrongdoing. According to international coverage of the demonstrations in Egypt, there has been little coverage of police or army using tear gas canisters as large bullets. As the demonstrations slow down, more evidence could emerge that tear gas canisters were used offensively as they are used in the West Bank. However, it seems unlikely given the fact that there have been almost no reports about this to come out of Egypt in the past seven days. The United States provides countries all over the world with military products with little regard of how the products are used. When it comes to tear gas, the issue is not that the United States is providing Israel and Egypt with the tear gas. The issue is how the gas is used and who it is used against. It is legitimate for a state to use tear gas in crowd control situations. It is not legitimate to use tear gas canisters as large bullets with the intention to kill or injure protesters. Well, let’s hope Mubarak leaves Egypt and the Egyptians get their democracy – but bear in mind, most democracies are not true democracies. I have been shot by such a teargas canister gun. I have been to such demonstrations. I have lived to see the lies that were told to bring the people into the street ONLY to be taken for fools in their ill-advised haste. I have seen far-bigger demonstrations that were CIA inspired. I have seen the alternative media subverted by the CIA, just as it has been again today. WHO WILL STEP INTO THE VOID BEING FOSTERED BY THIS FREEDOM-MOVEMENT CHARADE? Some CIA backed swineherd is standing in the wings. The CIA fights both sides of every war and backs the top ten contenders in every contest like this. PROGRESS -REAL PROGRESS- is never as easy as this is being seen to be made. Fools are made this easily, ONLY FOOLS. Again with the defeatist attitudes Don? This is no -real- revolution. This is only the cinch tightening around the collective necks of the Egyptians that we are all witnessing. This is “progress” in the sense of the future enslavement of all humanity. These people have been beaten down so far, when the door opened to their dungeon, and they saw a little second-hand light, they called it “freedom”. What? What do 21st Century Egyptians know of freedom? They could not even recognize their own enslavement for the last 30 years. Their enslavement is because of the American/Israeli Axis of Evil…. they now have the power to free themselves of this. If you insist on putting them down, or any other movement for National Liberation anywhere, please find another forum to do it in. wow Don.. if you’ve already given up all hope as it appears you have, why do you torture yourself further with paying attention to what’s going on in the world? misery loves company? Desert Peace, it’s nice to see that you still exist. I was beginning to wonder. I agree with your statement about the American/Israeli Axis of Evil. It is the biggest threat we have in the world today especially to peace. Now we know why the crowd control equipment was sent to Cairo. Everyone wondered where the Mubarak security forces had disappeared to after their murdrous attacks. They were pulled off the streets to kit them out with weapons. Al Jazeera is showing these pro-Mubarak forces attacking the demonstrators in the square. Rocks are flying from both sides. There is no military to keep the two sides separated in the square. The military controls the entries into the square, where the previous demonstrators were checked for weapons. Apparently, it is obvious that the military has let these pro-Mubarak forces in, with the idea that mayhem will result, and all those crowd-control items can be used to restore the peace a la Mubarak.